Step off the beaten path and head to Teijo national park and Bellevue Beach. Take a break from the city and head to Arboretum Mustila and Tulliniemi Nature Path. 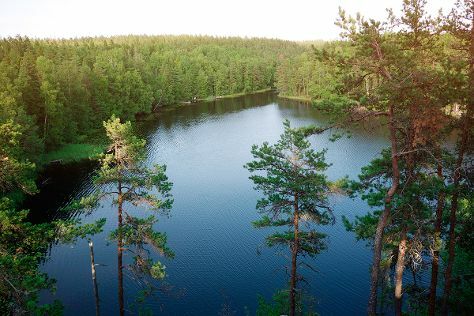 Explore Helsinki's surroundings by going to Porvoo (Cathedral of Porvoo & Porvoo Old Town), Paavolan Tammi (in Lohjan Island) and Nuuksio National Park (in Espoo). And it doesn't end there: relax and rejuvenate at some of the top local wellness centers, test your problem-solving skills at popular escape rooms, appreciate the history behind Sibelius Monument, and get engrossed in the history at Seurasaari Island and Open-Air Museum. To see ratings, maps, and more tourist information, refer to the Helsinki road trip planning site . If you are flying in from United Kingdom, the closest major airport is Helsinki Vantaa Airport. In November in Helsinki, expect temperatures between 5°C during the day and 0°C at night. Finish your sightseeing early on the 9th (Fri) so you can travel back home.